First the good news: the continuing growth in the vehicle population will continue to be the most important revenue driver in the aftersales business for the next years. In 2035, 1.5 billion cars will be on the roads worldwide, around 50 percent more than today. However, aftersales business will also benefit from the digital connectivity of vehicles and customers, as well as shared mobility. 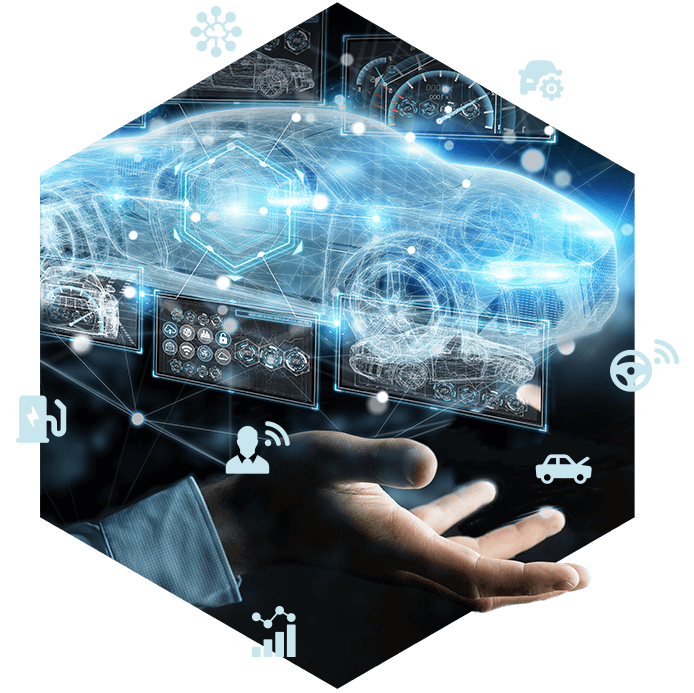 These technologies form the basis of new data-driven OEM business models, for example innovative offerings for shared vehicle fleets. Time is pressing. Those who want to hold their own in tomorrow’s competitive world must act now, since there’s also bad news: electromobility and autonomous driving will shrink aftersales revenues. Since electric drives are much less technically complex, and therefore subject to much less wear and tear, and require much less maintenance. Revenue will also be shrunk by highly automated driving cars. They are less demanding on the technology and not involved in accidents as much; repair costs and spare parts demand are reduced. PASSENGER CAR AFTERSALES 2017: DRIVETRAIN IS SALES „ENGINE“. Today, the aftersales sector generates the largest share of sales in the vehicle drivetrain – primarily with conventional combustion engines. Electric mobility will leave its mark here. DISRUPTION AS AN OPPORTUNITY – FOR THOSE WHO ARE PREPARED. “The digital transformation will transform the automotive manufacturers’ aftersales business in a sustained and radical way. However, the digital transformation will take time. Time that the automotive manufacturers should make use of to set a new course. In conurbations, the disruption by CASE technologies will very soon become felt. 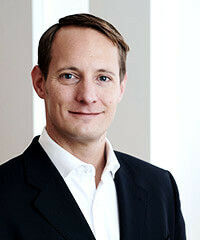 It’s essential to be prepared for it!“, says Jonas Wagner, Partner at Berylls Strategy Advisors. He bases his appraisal on Berylls’s new study “Quo Vadis OEM Aftersales?,” a detailed analysis of the automotive manufacturers’ aftersales business in the wake of the CASE technologies and the digital (r)evolution. Berylls’s market experts surveyed 30 top managers in the aftersales business about their expectations and their appraisal of the future development. 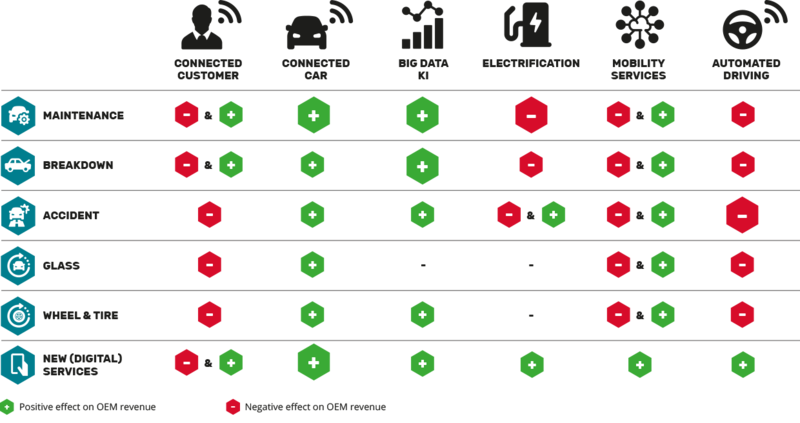 The picture showing the medium and long-term development of the aftersales business and key action fields is complemented with comprehensive market analyses and forecasts. OEMS DO NOT BENEFIT FROM GROWTH. 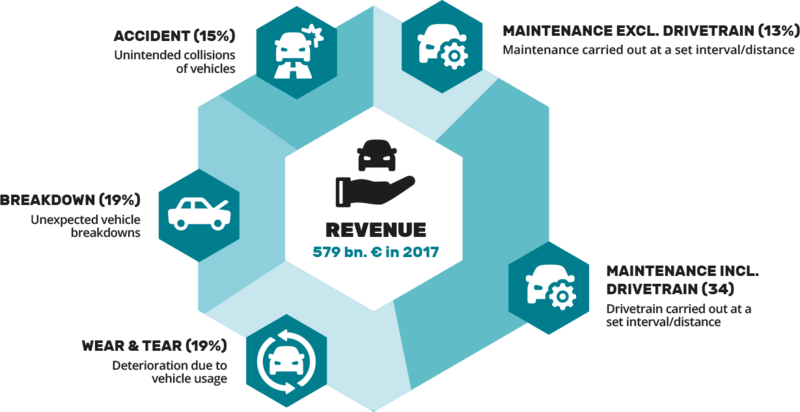 By 2035, revenue in the aftersales business – labor and parts – is expected to grow from the present 579 to 775 billion euros (+ 30 percent). 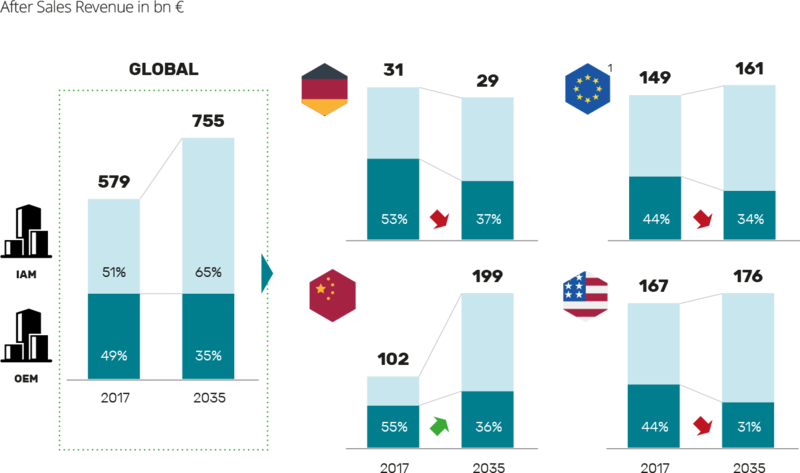 According to Berylls analyses, the biggest revenue growth in the next years will be obtained in China (+ 3,8 percent p.a.). In Europe and the USA, on the other hand, Berylls’s experts expect revenue to grow by only one percent annually by 2035. For Germany, they forecast that aftersales revenues will fall slightly. NEW AUTOMOTIVE WORLD: OPPORTUNITIES AND RISKS FOR AFTERSALES. The automotive future will change the aftersales business in the long term. Developments and effects are complex and their medium to long-term effects on aftersales are not yet precisely predictable. In 2017, the sector made about € 579 billion revenue in the personal vehicles sector, with repairs, maintenance and spare parts. The OEMs’ brand-name workshops account for about half of the global revenue, while the other half is divided between independent aftersales players. 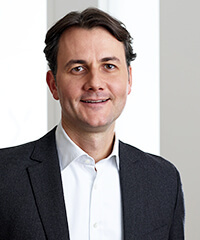 Three out of four of the top managers surveyed for the Berylls’s study do assess big data, artificial intelligence and connectivity as enablers for innovative and profitable aftersales business models, though the majority of them are insufficiently prepared for the digital transformation. NEWS KIDS ON THE BLOCK: COMPETITION IS GROWING. According to Wagner, the strength of automotive manufacturers lies in direct and close contact with customers: “Within the first four years after purchasing a new car, most customers remain loyal to the OEM for maintenance and repairs,” he continues. This should be a starting point for establishing an integrated customer relationship and improving the customer’s experience. “Offer the customers more than they expect,” suggests Wagner. But he also warns: “Competition will intensify.” This lucrative market will also be a magnet for new players, including some from outside the industry: suppliers, independent workshop chains, online workshop portals and service providers. GLOBAL AFTERSALES 2035: OEMS DO NOT BENEFIT FROM GROWTH. dramatic: Their share of worldwide aftersales revenues could fall to around 35 percent. SHARED MOBILITY: INNOVATIVE SERVICE CONCEPTS FOR MOBILITY SERVICE PROVIDERS. Through the introduction of autonomous driving systems, shared mobility fleets will grow to around 20 million vehicles in China, the USA and Europe by 2035. At the same time, professional replacements must be found for all services previously provided by drivers, such as daily fleet maintenance. This includes daily vehicle maintenance, visual and functional testing, loading handling and parking and, according to Berylls experts, will amount to up to 320 billion euros in 2035. In addition to a high-level of automation and deep integration into the operational processes of mobility service providers, the real profitability lever – and the OEM’s strategic pound – lies in the integration of TCO-optimized special-purpose vehicles with infrastructure and processes in service hubs. MATCHMAKERS: NEW PLAYERS IN THE NETWORKED AFTERSALES WORLD. 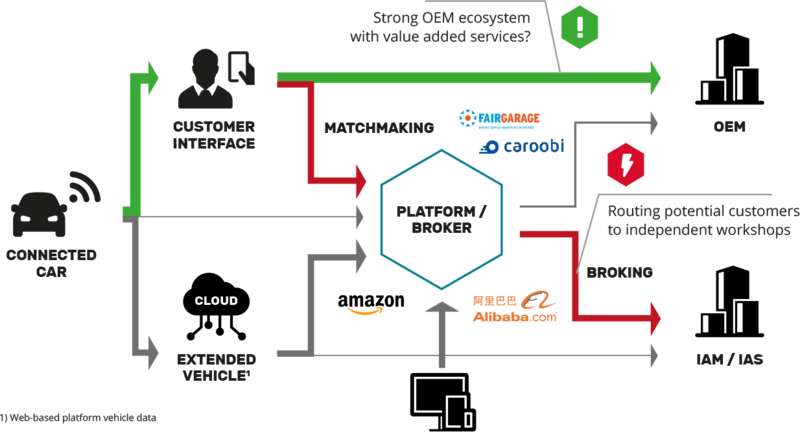 The connected customer with his connected car is for OEMs as well as for companies outside the industry, an attractive target group for those wishing to enter the profitable aftersales business. The better one wins!